The writer of these words has done time in a military prison, for refusing to serve in the occupied territories. The word "Refusenik" may not be suitable in this context, inasmuch it creates a negative connotation towards the objector, while the message which he would like to pass is a constructive and positive one. Therefore I prefer the term "Disobedience", as the obedience is still the preferred behavioral model by the objectors, in most cases. In other words - the "occupied territories objector" is a loyal citizen, who definitely accepts the authority of the state to impose its rule on its individuals, using the law - except for the very special cases, in which this law evidently contradicts the very basic values of the individual. The territories objector is not an anarchist, nor is he an immoral law-breaker, and he is not even a pacifist, or army-service objector (without any attempt to de-legitimize the pacifist stance), as people sometimes like to present him. On the contrary - the objector is naturally a loyal combat soldier (otherwise, most likely, he wouldn't be sent to the territories in the first place), whose disobedience is limited to the order to serve the occupation. In this essay I will try to deal with the major arguments against the disobedience. My first assumption is that I have no argument with the reader as for the immorality of some of the actions that the Israeli Defense Forces are taking in the territories. Those who think that there is no morality problem (and I am aware to the fact that this claim is valid and legitimate - the IDF must hold some type of occupation in order to defend the country against people who wish to destroy it, etc. ), in any case, they don't have any debate about the service. The argument with these people (some of whom I truly respect) does not belong here. I would like to aim the discussion to those who think that there is a morality problem. One solution to such problem, both in the personal level, and as a means to express a protest, is the refusal, which must go together with the agreed sanction - namely, the imprisonment. Going to prison, in my personal view (most refuseniks disagree with me on this), is an essential part of the refusal. The goal of the refusal is not to avoid the service - to do that it takes just a simple shirking with some stupid excuse (in fact, this is exactly what thousands of reservists actually do, some of them oppose the objection quite righteously! But their action causes much more damage, as I will later show, than any possible consequence of the refusal). The main cause of the refusal is expressing a protest, in quite an effective way. Why, then, not to refuse? -- The first argument against it involves the validity of the immoral law. The imperative to obey the orders is absolute (claim our opponents), even those orders which are immoral and even illegal - as long as they are not "obviously illegal" - and this is simply because they were given by an authorized agent, which legally received its authority in accordance to democratic rules. This is probably the most common argument. This argument has few flaws: first, telling an "obviously illegal" order from just an "illegal" or "immoral" one is tricky and cannot be unequivocally defined. The term was born in the case of Kfar-Kasem in 1956, in which 43 Arab citizens were shot to death by Israeli soldiers, during a curfew they didn’t know of. The court defined the order as "an order above which flies a black flag, an order which stubs the eye, and stirs up the heart, if the eye is not blind, and the heart is not deaf". But isn't demolition of the house of a suspect of throwing a Molotov Bottle, without any real legal procedure - "stubbing the eye"? (this essay was written 13 years ago…) Isn't arresting thousands of people without a trial - "stirring up the heart"? Can a society, which calls itself "democratic", deprive basic rights from individuals under its control - without its heart becoming "deaf"? During World War 2, thousands of people in Europe have committed the most shocking and immoral deeds, just by obeying orders which were given to them by authorized agents (who were democratically elected and nominated) - keeping this in mind can realize for us, that democracy does not mean the arbitrary control of individuals by the majority, whatever its will might be - but its true meaning is this: fulfilling basic rights and liberties of human beings, which stems from the principal of equality of all humans - a principal from which stems the system of election by the majority, as well. And I am not for one moment comparing the actual actions of the IDF soldiers in the territories with those of the Nazis. 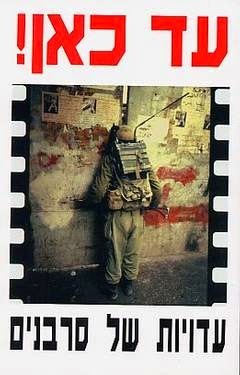 -- An Israeli magazine featured an article about the objectors from the first Intifada (the Palestinian uprising in 1988). Most of it was comprised of reactions of public figures to the refuseniks. I was sorry to discover, that of all the responders, some of the poorest claims came from Knesset Members for whom I voted (at that time): Mr. Virshuvski (of Meretz, a leftist party) was afraid that refusal might give "ammunition" to future evacuation-refuseniks from the right, if they were ordered to abandon their colonies. But how can one compare a soldier who refuses to serve in the territories, and by his own will arrives at the trial, and even gets by himself to the gate of the prison (this is my personal experience), and never asks for remittal - to a settler, who physically resists his evacuation, beats soldiers, and is never punished for his behavior - or gets a powerful lobby when he does, until he is released a few hours later? -- In the same magazine, MK Ran Cohen (Meretz) brings two arguments against the refusal: First, it is not possible to unilaterally leave the territories (but did any of the refuseniks demand this, back in 1990? ); and second, because "the Palestinians will make peace with warriors, not with deserters". Must we understand from these words, that the refuseniks are not combat soldiers? Or that the Arabs only understand the language of force, and respect only the powerful, because they are primitive? Or that the oppression of 3 million people is, per Mr. Cohen, a state of war? Does it have to be that any army officer of the rank Colonel and above (like Cohen) – will always identify with any military action? Even Geula Cohen (of the extreme right wing), who embraced the willingness of the objectors "to carry their punishment with love" warms my heart more than that of Virshuvski and Ran Cohen, my ex-representatives in the Knesset. -- The next argument is more practical: suppose you are right, why don't you stay with the soldiers in the field, and be the moral soldier yourself, he who prevents other soldiers from doing "extreme actions"? This is a strong argument, and I even used it myself when I had to give to myself an excuse for serving there twice, before I refused. Well, first, in my view, the mere presence in the territories with uniform, even without doing anything "bad", is by itself a cooperation (even if it's passive) with the oppression. The diligent reader can refer here to the excellent article by Yishai Rozen-Zvi, "The Enlightened Occupation". But what is more important: in military units in which there are practically no "extreme actions", and no problematic soldiers that need to be restrained (and such was my unit) - this argument is insignificant. The oppression manifests just be taking part (even a small one) in the occupation army. No "extremists" are necessary to deprive freedom, basic human rights, food, medicines, and so on. -- There are ways to fight against the occupation using legal means, such as demonstrations, petitions, letters to the papers, and even "gray refusal", i.e. shirking. Well, I don't eliminate any legal measure (except the shirking), however I would argue about its effectiveness. In fact, here is the strongest argument against the refusal: why don't you bring your case to court? If you think that the occupation is immoral, and as you say it is even against the international law, to which Israel is obliged - with all due respect, come and defend your point in front of distinguished law and moral officials, and accept their verdict. This is really a beautiful argument. It only has two problems: First, the occupation is totally legal, by Israeli law, which is based on the British mandate regulations. This is exactly what the judges will say. We don't necessarily claim illegality - we claim immorality. The law can be changed at any time - the state of Israel can retreat from all its obligations to the Geneva Treaty - and by doing that, to turn all the settlements to become totally legal in one shot (what this will do to the treatment that its Prisoners Of War will get in the future - is a different story); But morality, although being different in various cultures and in various people's eyes - still for every person is universal and permanent. But furthermore, even as for the morality, by which the judges of the Supreme Court for Justice ("Bagatz") sometimes decide (and sometimes even in contradiction to the Law!) - after all, they "sit within their own people", and they simply cannot go too far away from the public consensus. Plus, the Supreme Court traditionally avoids giving verdicts in debatable cases, which are considered "political". What can we hope for in cases when the consensus itself is immoral? I am afraid that the Court will not salvage us in this case. -- What about the shirking option? Practically (and sadly), this is the most popular option among most of the occupation objectors, who are not willing to pay a personal price. We are taking many thousands of reservists here. This is simply cheating, but it's absolutely legal: fake sick slips, fake flying tickets, etc. From a moral point of view, this is basically like cheating on the IRS, even if it is done for protesting reasons. Its protest is unheard, but its damage is inevitable: when a soldier refuses to serve, and gives a decent notice ahead of time - its unit can get a replacement; however, the unit would not get one in replace of those who just escape the service legally. Thus, contrary to the common view, the territories objector, who is well heard and its refusal is sincere and authentic - is the one doing the most Zionist action, as opposed to the thousands of "patriots" who get away by cheating. -- And what if everyone who does not like some section of the law - will violate it? What will be with the rule of the law? In my view (which is different than that of some objectors), there is one sharp and clear indication, which distinguishes between those who break the law for a sincere ideological motive, and those who "don't feel like", and this is the willingness to pay the due. Imprisonment is the Litmus Test, which proves the seriousness of the deed. But, even if there is some eccentric "tax objector", who wished to do time in prison - there will still be an argument distinguishing him from the territories objector, something that might be named "the sincerity claim". We can seriously claim (although not fully prove), that the moral motive is authentic, inasmuch it is based on "weighty" rationales, which remain so even in the eyes of those who don't agree with them. Which is something you cannot say about someone who doesn’t "feel like" paying taxes. The "Courage to Refuse" people are not eccentric and not anything like law-breakers - they comprise a solid and well-reasoned group, backed by a long line of distinguished public figures. -- There are those who claim, that publicly breaking the law will lead to complete anarchy and even to a civil war. But in practice, the contrary happens: There was no civil war since this claim was first raised, 15 years ago. On the other hand, the shirking phenomenon has grown dramatically, including so many who left the country. This is a much more dangerous issue, because of its vast scope, and thus for its significant effect on the army's power. A few hundreds of dissidents are truly a marginal issue, when it comes to the "order of battle" (exactly as the IDF claims); on the other hand, its public protest effect goes way beyond its relative part in population, in that it causes an incisive and continuing discussing. -- An interesting argument was given by Ari Elon, the leftist brother of Benny Elon of the extreme right (the former is now the newly nominated Minister of Tourism, March 2003): One has to serve everywhere, even in the territories, as long as the IDF is a Defense Force "in essence"; and immediately after it ceases to be such - one has to refuse to serve, even in an administrative job. Doesn’t this sound a little pious? Ever since 1973, the IDF has not done any defensive activity against ordinary Arab army. Even the anti-terror actions (and let's assume that they do prevent terror...), are done against a national group, which in our view fights for a just cause (although using unjust measures). Therefore, the IDF has become non-defensive army, in a sense, and it has a "defensive nature" only with regard to some local incidents. But, even if it was an "essentially defensive" army - is it OK to do immoral things, like collective punishment, even by such a "defensive" system? -- It is surprising (and it may be worrying as well) to realize that the most common claim against my personal action was also the most prosaic and non-principal: why pay such a costly price (humiliation in prison, disconnection from the family, financial loss), and why you? - this claim must be addressed by each and everyone personally. Not everybody who supports the refusal can afford the penalty. This really depends on each one's personal, family, financial and mental situation, and therefore I don't blame anybody who refrains from doing it. There are people who refused 6 times, spend over 170 days in prison, but not even one day in the territories. -- And for a last non-principal argument: can the action of refusal have any influence, can it convince somebody, can it make any change at all? My heart would like to think that it can (keep in mind - this essay was written in 1990, in the eve of the Madrid Conference, at times when it was forbidden even to meet with PLO members, and before the Oslo Accord). It seems that the effect is really there: a Territories Objector contributes 1-over-500 to the campaign, while the relative contribution of a participant in a demonstration (without denying its importance) is way less than that. And yet, even if I haven't been successful in convincing even one person (and this is very unlikely) - still I have done much more than I, normally not active politically, was used to doing. This is a loud and blatant action, which has much "echo" in the close circle of the doer. This is my way of noticing my close relatives and acquaintances: people, we are all cooperators with a crime, to which I don't want to contribute any more.